“…have you ever had your world fall apart in front of everyone? & your life look like a circus? I have, But God…. No one else understands. The pain to yourself. To others. Though I never wanted to disappoint anyone – I did in a major way. But when you own your failings & take your mask off- the fall from grace is actually a fall into grace. 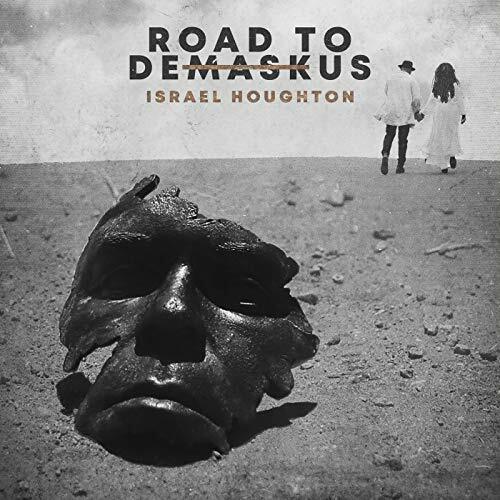 And there is no peace like the peace Jesus brings…” Gospel/r&b/worship artist Israel Houghton, is back with his brand new album Road To DeMaskUs– his first in 3 years since Covered: Live In Asia; on a new label, and I believe that it is in this album that he is really real with us listeners. Not that any of his previous material, including songs like “Friend Of God”, “Jesus At The Center”, “Your Presence Is Heaven” and “You Are Good”, aren’t honest and vulnerable; yet at the time Israel hadn’t experienced the valleys and the hardship that he endured in 2015 when his marriage broke down and subsequently disintegrated. It was in that moment when Israel decided to take off his mask, because as much as Israel was trying to convince himself that trying to be fake and perfect all the time was convincing the listeners and his fans that he had the perfect life and he had it all together; the mask he had on all the time was actually suffocating his own breathing and his own well being and sanity. The result of this therapeutic recording session all throughout last year, with a sense of really appreciating who he was in Jesus without his mask off, is 11 of the most impacting songs of the year. Road To DeMaskUs speaks to us about whether we have masks on ourselves and what we all should do with those, yet the album as a whole speaks about Saul’s conversion to Paul and what that means for us as Christians. For we as Christians are free, and we don’t need to put the mask on. Once we realise this, life can be lived freely and in abundance with no reservations. As an album Road To DeMaskUs is nothing short of brilliant, as it details the start of a new chapter for Israel, a start that I gladly have taken interest in. “…You know how certain songs come with their own set of reverb so to speak? This is one of those songs for me. It speaks to the very fabric of my life. Past, present & future. The visuals that this song paints, God’s furious reckless unstoppable love, grace, redemption & unrelenting mercy for us. Wow! I mean… there’s no wall You won’t kick down- lie You won’t tear down…? Come on… what a picture of our God. In my most reckless moments He matched and overwhelmed that recklessness with a crazy reckless love of His own. This song…. It has impacted me so much that I chose to make it the lead single for my new upcoming release…I’m excited about it. I’m excited about sharing the freedom that comes with being transparent and surrendered to the force of God’s favor. This song certainly helps to underscore that in the most poignant way. Get ready to download it and let that reverb and echo of His presence wash over you as well…” A glance through the tracklist finds me immediately gravitating towards “Reckless Love”, the album’s first single and a cover from Cory Asbury. And from the above quote from Instagram, one can tell just how excited and passionate Israel is about the song, which is greatly evident in his confident delivery of the lyrics. At his new label home, one would think that Israel would’ve deliberately change his sound to be more pop and CCM. Not the case here, as we are met with a track that brings us the signature gospel and soul sound from the Israel we all know and love. As Israel earnestly and unequivocally makes this melody his own, he authoritatively cries out across electronics and soothing keys, and alongside an engaging gospel choir, that Jesus is a pursuing God, that He will not rest until we are found, that there is nowhere He would go where He would not find us. Thematically reminding me of Psalm 139, as well as Sarah Reeves’ “Nowhere”; we are definitely blessed by Israel’s version of an already explosive mega-hit, that has gone global, and into the mainstream, with covers from Cimorelli, Anthony Evans and even Justin Bieber already gaining millions of views on Youtube. As much as I love “Reckless Love” and Israel’s signature gospel rendition, his new original melodies are a sight to behold (or a sound to be-hear, but that’s not a common expression so…). Album opener “Secrets” is a duet with Israel’s wife Adrienne that is the heartbeat of the album, as both husband and wife fervently relay to us that even with all of our secrets and all of our shame, God sees it all and loves us warts and all anyway. Even if we do not repent nor acknowledge Jesus Christ as our Lord and Saviour, He still loves us and always will, and that fact makes this song, though uncomfortable and confronting, extremely needed and necessary in a society and culture that most of the time guilt trips us into doing more for God so that He can love us. It’s upside down as Jesus loves us without condition anyway, and that’s what makes this opener beautiful and one of the most compelling openers I’ve heard in a long time. Adrienne also joins Israel on the acoustic guitar driven reflective ballad “Be Still”, sung from God’s perspective, as we are reminded that He is with us always, so we can be still and just bask in the presence of our Almighty Father- a concept similar to “Be Still And Know” from Steven Curtis Chapman. Guest vocalists are the ‘in thing’ these days I reckon- why else would Israel have 3 more songs on the album with guest vocalists (apart from the two with his wife)? In all seriousness, “True” features The Walls Group and is a album highlight, led with light acoustics and a reggae atmosphere, with all vocalists outlining that Jesus’ word is true, that everything that Jesus says can be believed because of the promises He has kept in the past; while Israel once again teams up with Chevelle Franklyn, this time for “Winning Side”, a gospel infused/Caribbean flavoured calypso style melody, which delves into the notion that because Jesus is with us, we cannot lose and are therefore on the winning side. “Promise Keeper” with fellow label-mate, the up and coming Travis Greene; is the final song featuring a guest vocalist, and is mind-blowingly out of this world in a crazy good way- Travis and Israel sing together in perfect harmony to create an anthem for the ages that outlines how Jesus is a promise keeper, and ‘…You will never fail, Your love is true…You deliver on Your word and I will trust You…’, a concept that we all should be able to declare with confidence now and/or in the near future as we walk through the Christian life. The 90’s and early 2000’s gospel music, complete with saxophones, trumpets and other big band brass instruments, with a hint of EDM, is what “Easy For You” tries to emulate, with moderate success- musically the song is catchy and very danceable, however is a tad too loud and slightly over-the-top. Much to my sadness, as Israel’s passion here is undeniable; as we ardently proclaim that what is impossible for us is easy for Jesus. On the flipside, the heavily produced autotune prominent hand clapping 7 minute long Carman-like “All Together” is a blast to listen to, and isn’t a drag, with Israel highlighting the notion that Jesus holds our life and the whole world together, thus there is reason to praise Him; while “Free Indeed (You Said I Am)” is exactly that- a gospel song set to the theme of “Who You Say I Am” from Hillsong Worship- with a gospel choir for good measure and added variety. “Love Never Fails” is a cover from Seth And Nirva when they recorded their debut album way back in 2016, and Israel’s version is sung to perfection and professionalism, as we are glimpsed into an ardent prayer relaying that Jesus’ love never fails- it’s simple lyrically, and effective musically, and that’s probably why it’s one of my favourites from the album, because it doesn’t try to be over flowery nor complicated, but rather presents Christianity as simple; to love as Jesus has loved us because His love never fails. Road To DeMaskUs then ends with the slower paced emotional keys led ballad “Feels Like Home”, thematically similar to the parable of the lost son, in that Jesus will always be our home, no matter how far we run away from Him and how unworthy we think we are- as Israel majestically conveys to us that ‘…You never run away, though I have run before, from You I can’t escape, my heart is tied to Yours, and like the prodigal, You look beyond my faults, You take me by my hand, back to Your heart again…’. A fitting way to end the album, as we remember that even with our masks on, we can run back home to the Father; this track and the album in general further lead us to take stock at the person in the mirror, as we figure out how to act in front of others and whether we are ready to shed our facades for good. One could think that after Israel’s marriage unfolding in 2015, as well as his termination from the staff at Lakewood Church (headed by Joel Osteen), that he could’ve called it quits and retired from music altogether. However that isn’t the case, and the result is the exquisite, brilliantly recorded Road To DeMaskUs. While Cory Asbury should be proud that his song is circulating the globe at a quick pace; Israel Houghton should also be proud, of doing this song justice, and subsequently creating an album worthy of multiple listens on iTunes- reminding us all that it doesn’t matter the genre of an artist, as long as they are praising God and drawing people into His presence. Israel’s first album in 3 years, but also his first studio album since Love God Love People way back in 2010; a new label means a new chapter for him, and I can’t wait to hear what God has in store for this coming year for Israel. Well done Israel, you have recorded this exemplary project to perfection; can’t wait to hear more from you!